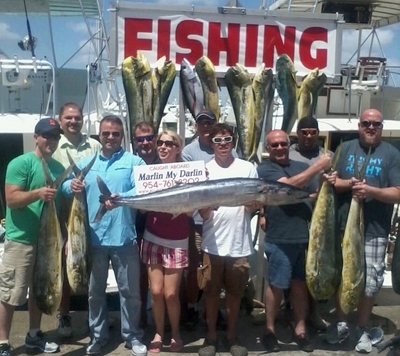 This Fort Lauderdale fishing report is once again a rosy one as we have continued to find Mahi-Mahi, Wahoo and Tuna out of our inlet. Most of our fish have come by trolling but we continue to do a bit of live baiting as well. Bottom fishing has been very consistent for large Amberjacks up to 60 pounds on the deep wrecks. Vermillion Snapper are biting well but are smaller with about a third of them going back over the side. Sailfishing has slowed with only occasional fish. We are finding that some of the Mahi-Mahi have moved slightly deeper as the current has switched back to the north now. Gone is the near shore clean blue water and we have been finding that deeper blue water out in 600 feet. This has slowed the Mahi bite somewhat but we continue to locate schools in water less than 800 feet in depth. Different circumstances this past week as we generally consider a south current to often be a curse. There are always exceptions in fishing and that south current we experienced for several days was bringing us some really nice fish. They are still available,but a bit more difficult to locate now that the playing field has opened up to 800 feet for the majority of our fish. Some good Wahoo around as you can see by the picture of that 40+ pound fish. As usual a deep planer line or a really long surface bait gets the most attention from them. A short trace of light leader wire just ahead of the bait,which for us here aboard the Marlin My Darlin is typically a Bonito strip, will increase your percentages of that big one not breaking your heart and cutting you off..
Amberjack season as well as Sharks are in full swing. Lots of big Jacks on the deep wrecks. Occasional Mutton Snapper. Our weather has been very nice. Little to no rain as we all continue to adjust to the warmer days now. A light breeze which has been the afternoon norm now is welcomed as it seems to begin just in time to take the edge off. Tight lines and good fishing.